Things are about to get a little science-y up in here. Before we can talk about antioxidants, let's go over free radicals for a minute. They sound scary and basically every skincare commercial tells you to be afraid of them. A free radical is an atom or molecule that has an unpaired electron in its outer shell. Most of them are very reactive, because basically, atoms/molecules don't particularly like having that unpaired electron, so they work quickly to find something to react with to have a whole pair again. Often these reactions are chain reactions, breaking and re-forming many bonds to finally end with a more stable form. Free radicals occur naturally in the body during metabolism or when the immune system is trying to neutralize viruses and bacteria, but they are also caused by coming into contact with environmental aggressors like pollution and radiation. The body can normally take care of these free radicals, but they can start to build up and cause damage if antioxidants are unavailable. The real damage occurs when the free radicals start reacting with cellular components DNA or the cell membranes, which can cause the cell to not function properly or die altogether. So how do antioxidants help? Antioxidants neutralize free radicals by donating one of their own electrons to stop the chain reaction before damage can occur. They're stable in either form - pre- and post-electron donation - so they don't become free radicals themselves after donating. They act as scavengers and seek out the damage-causing free radicals, preventing cellular damage and disease. The most common antioxidants present in the body are Vitamins C and E.
Antioxidants in skincare can work as powerful antiaging ingredients by stopping free radicals from causing damage to the skin cells. I rooted through my collection to find a few great products that make use of antioxidants. 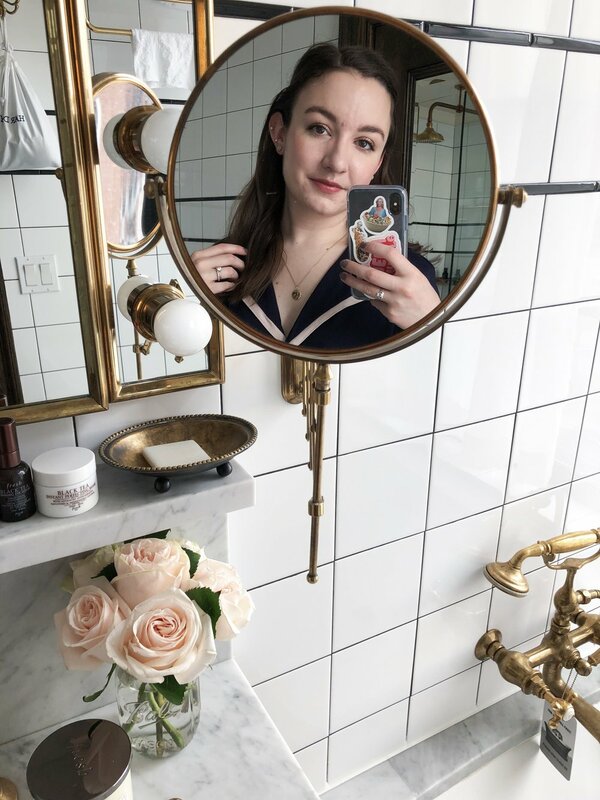 Masks | My favorite masks that have antioxidants as main ingredients are the Glossier Mega Greens Galaxy Pack and the Youth to the People Age Prevention Superfood Mask. They're both quite similar - thick, creamy masks that cleanse and purify the skin without stripping it. They both feel quite nourishing and reviving to the skin, despite containing clay. As the names suggest, they also both supply the skin with antioxidants through the use of greens like spinach and other leafy greens. Serums | The first serum that came to mind was the Kypris Antioxidant Dew - it gives the skin such a dewy, radiant glow. It uses Superoxide Dismutase (another powerful antioxidant), as well as Vitamins C and E. It replenishes the skin after a long day, and it mixes well with other serums. The Drunk Elephant C-Firma Day Serum is another favorite, and uses Vitamin C as part of an antioxidant complex to brighten the skin and restore firmness. This is my favorite to use in the morning - it makes the skin so radiant. Facial Oils | Another obvious example of a product full of antioxidants is the Sunday Riley Juno Oil. It says right on the label it's antioxidant-rich, coming mostly from Blueberry Seed and Cranberry Seed Oils. I've also been using the Biossance Squalene + Vitamin C Rose Oil a lot, and they're quite similar. They're both lightweight and can be used day or night, and they both leave the skin almost juicy-looking. I can't pick a favorite. Sunscreen | Since UV radiation creates free-radicals, it's only natural that a good sunscreen would contain added antioxidants. The first that comes to mind is Glossier Invisible Shield. It has an antioxidant complex containing Vitamin E, Vitamin P, broccoli, and aloe leaf extracts. I've raved about this over and over, but it's really my favorite face sunscreen because of how lightweight it is. I love that it's not only protecting my skin with SPF, but also with the added antioxidants. What are your favorite products with antioxidants?